Results of a new study suggest that changes to current treatment recommendations for some dogs with mitral valve disease may be in order. Cardiac disease is not an uncommon finding in older dogs, with endocardiosis being the most frequent cause.1 How frequently heart disease and murmurs are diagnosed in dogs is uncertain. This is because much of the data collected come from specialty centers and universities—not general practice. It should be noted that the patient workup in most cases was insufficient to truly differentiate between dilated cardiomyopathy and endocardiosis.2 The study was very robust, however, with nearly 112,000 dogs included. Not surprisingly, the mean age at initial diagnosis was almost 10 years. Certain diagnostics are clearly indicated once a murmur has been detected, regardless of whether overt signs of cardiac disease are present. Because murmurs typically occur in older patients, routine lab work is indicated. Blood pressure measurement is also recommended because hypertension will negatively affect the diseased heart (the heart must generate much higher pressures in hypertensive patients). Most importantly, imaging is clearly indicated in these patients. 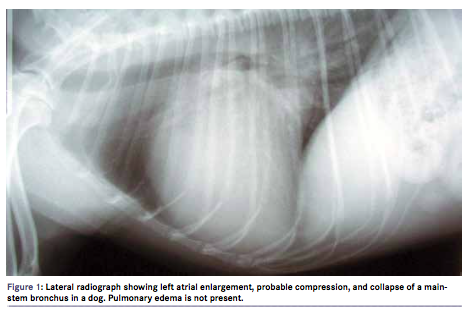 Radiography is the first-line imaging choice; echocardiography is useful for patients in which radiographs are not diagnostic or to rule out dilated cardiomyopathy in larger dogs. Radiology will help determine whether the signs are respiratory or cardiac in origin and if heart failure is present (FIGURE 1). Imaging is also the basis for differentiation between stage B1 and B2 murmurs. For radiographs to be diagnostic, they must be of optimal quality. Patients must be positioned properly and fully inspiratory when the radiographs are obtained. Poor positioning and expiratory radiographs can easily lead to a misdiagnosis of cardiomegaly or even heart failure. Whether to treat patients with stage B mitral valve disease (i.e., dogs with endocardiosis and a murmur but no clinical signs of cardiac disease) is debatable. To date, there has been little indication that treatment prior to the development of clinical signs (e.g., cough, exercise intolerance, weakness, dyspnea) is of benefit. A large placebo-controlled trial that included 229 cavalier King Charles spaniels with a murmur (including both B1 and B2 murmurs) found no improvement in survival or time to onset of heart failure when enalapril was given.5 Another trial using enalapril in patients with stage B2 murmurs showed a modest benefit at best, but only because all-cause mortality was improved.6 These results indicate that the benefits of enalapril may not have just been related to cardiac benefits in this study. Based on these results, however, treatment of dogs with stage B1 and B2 murmurs generally was not recommended—although, obviously, the bigger the heart is, the sooner heart failure will occur. Independent of these results, starting an angiotensin-converting enzyme inhibitor was not uncommon, although the benefits, if any, were likely not spectacular in dogs with stage B1 or B2 disease. In the EPIC trial, dogs treated with pimobendan had 15 more months of symptom-free life than did dogs treated with placebo. Although previous results were not encouraging, recent research has shown that treatment with pimobendan in stage B2 patients can result in a quite marked improvement in survival and can delay the onset of congestive heart failure.7 The randomized, blinded, placebo-controlled, prospective, multicenter EPIC trial (Evaluation of Pimobendan In dogs with Cardiomegaly caused by preclinical mitral valve disease) involved 360 dogs.7 All the dogs had mitral valve disease and left atrial enlargement (on echocardiogram, a left atrium:aorta ratio of >1.7, where normal is closer to 1). With pimobendan treatment, the median time to reach the primary study endpoint (i.e., onset of congestive heart failure or cardiac-related death) was 1228 days; with placebo the time was 766 days. This means that the dogs treated with pimobendan had 15 more months of symptom-free life than did the dogs treated with placebo. All-cause mortality was improved with pimobendan, most likely by reducing deaths from heart disease. All-cause mortality is an important marker to consider to verify that the medication does not have an adverse effect unrelated to the primary endpoint. The results of the EPIC trial have significantly changed recommendations for the treatment of asymptomatic dogs with mitral valve disease. Because there is a significant improvement in quality of life and an overall improvement in life expectancy, early intervention is now clearly indicated. This means that proactive screening programs are in the best interest of these dogs. Initially, this can consist of as little as a good physical examination with thorough auscultation. Once a murmur has been detected, additional diagnostics will be needed and the frequency of rechecks will likely increase. For affected dogs, the EPIC trial results are very good news. Dr. Carr received his veterinary education at Ludwig Maximilian University in Germany and the Universities of Missouri-Columbia and Wisconsin-Madison in the United States. He is currently a professor of small animal medicine at the University of Saskatchewan’s Western College of Veterinary Medicine in Canada. Patterson DF. The prevalence and types of cardiovascular disease in dogs. Ann N Y Acad Sci. 1965;127:481-516. Mattin M, Boswood A, Church D, et al. Degenerative mitral valve disease: Survival of dogs attending primary-care practice in England. Prev Vet Med. 2015;122:436-442. Mattin MJ, Boswood A, Church DB, et al. Prevalence of and risk factors for degenerative mitral valve disease in dogs attending primary-care veterinary practices in England. J Vet Intern Med. 2015;29:847-854. Atkins C, Bonagura J, Ettinger S, et al. Guidelines for the diagnosis and treatment of canine chronic valvular heart disease. J Vet Intern Med. 2009;23:1142-1150. Kvart C, Haggstrom J, Pedersen HD, et al. Efficacy of enalapril for prevention of congestive heart failure in dogs with myxomatous valve disease and asymptomatic mitral regurgitation. J Vet Intern Med. 2002;16:80-88. Atkins CE, Keene BW, Brown WA, et al. Results of the veterinary enalapril trial to prove reduction in onset of heart failure in dogs chronically treated with enalapril alone for compensated, naturally occurring mitral valve insufficiency. JAVMA. 2007;231:1061-1069. Boswood A, Häggström J, Gordon SG, et al. Effect of pimobendan in dogs with preclinical myxomatous mitral valve disease and cardiomegaly: The EPIC study—a randomized clinical trial. J Vet Intern Med. 2016;30:1765-1779.